Good quality and fit, prompt delivery. So far, has provided relief where other products have failed. A good investment! Very pleased used them on a long walk and feet felt much better. Product serves it's purpose. Since it covers the heel it would be helpful if the the gel is outlined on the outside so that the wearer can see if the gel is positioned correctly. The area is difficult to observe. Othen than that it works well and is not cumbersome. 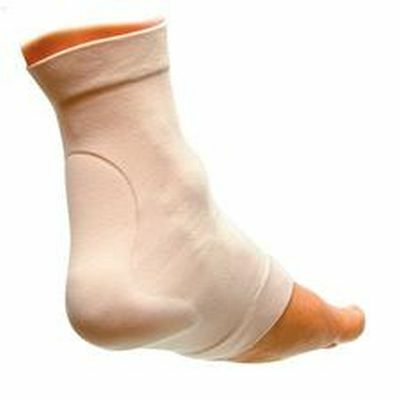 Pleased with the comfort and ease it gave to a very painful achilles heel problem. I have been pleased with this product and it has helped a lot with the discomfort of my Achillies tendonitis. Excellent for pain, needs a more fashionable look for teenagers! Bought these for my daughter who is suffering with heel pain. She said they are great for the pain but doesn’t like how ugly they are! Fine to wear under socks or thick tights but she’s refusing to wear them when they can be seen. Perhaps someone needs to invent a medical sock that also looks good so it appeals to teens!! I bought the heel sleeve to take on holiday soon so haven't worn it yet. Very impressed with your customer service. I ordered one day and received the item the next day. Well done.